1) Allows the shooter to have proper cheek weld when using optics on the shotgun, the adapter was designed specifically with this purpose in mind. Optics can be mounted via the picatinny rail, which mirrors the dimensions of a flat top AR15 upper receiver identically. The rail being the same height insures a sight picture like that of an optic mounted on an AR15 rifle. 2) Uses any AR15 style stock. The multitude of AR15 style stocks on the market will allow users to fit the shotgun to themselves and to their intended use for the shotgun. 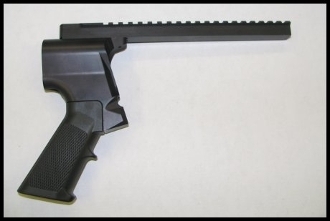 3) Uses any AR15 style pistol grip. The user can switch grips as necessary to meet their personal preference. 2) Optics mounting rail is machined to M1913 picatinny spec from 6061-T6 aluminum billet for mounting of red dot optics. The rail is also mil-spec hard coat anodized.